Joseph Agyepong Siaw wanted to become a pilot or a marine engineer, but ended up selling school books on the street. He made his fortune from what everyone else didn’t want – with the help of tricycles from China. He may be one of the richest men in Ghana, employing 250,000 of his countrymen, but it all began in struggle. Joseph Agyepong Siaw holds his lean, early years in abhorrence. Reason: the serial entrepreneur and founder of the Jospong Group of Companies had the odds stacked against him from the day he was born. “My mother told me that when it was time to give birth to me, she had to move to the village because my father had three wives and traditionally, in the Ghanaian culture, when you are in that situation you have to go to your parents to deliver your baby. So when she was walking in a farm, she went into labor and started crying for help. 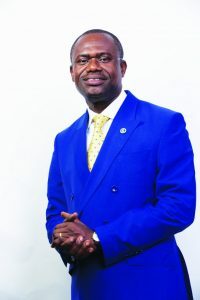 At the time there was no hospital so we had to call on the village prophetess to come and assist in my delivery,” says Agyepong as he talks to FORBES AFRICA of his humble past in the conference room of his Adjiriganor office, in the country’s capital Accra. The walls of the room say it all; they are covered with trappings of wealth and numerous entrepreneurship awards. Agyepong is an enigma in corporate Ghana. 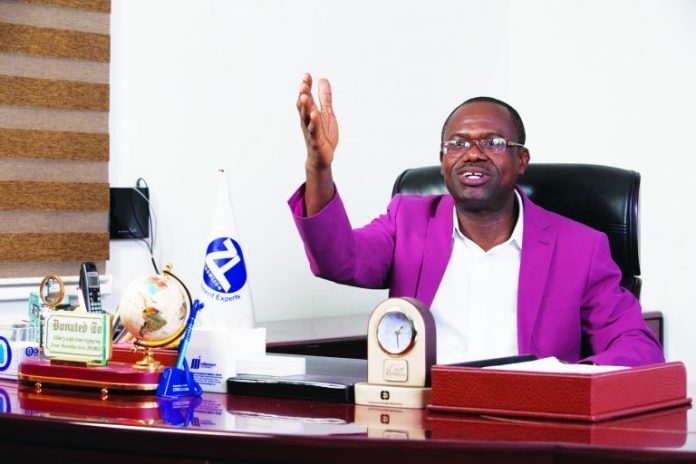 He shies away from interviews and public appearances – very little has been documented about the serial entrepreneur who has made a fortune through revolutionizing solid waste disposal in the West African country. He is assertive and confident with a demeanor that commands attention without being arrogant. His personality is warm and engaging. What was to be a 30-minute conversation went on for three hours. Agyepong finally settles down to recount his journey, one that began with the wrong name. As one of 17 mouths to feed, and with little income from his father’s dwindling business as a photographer, Agyepong had to rely on his wits and brawn for survival. The difficult upbringing only strengthened Agyepong’s resolve to succeed. With the help of his elder brother Daniel, Agyepong and his siblings were relocated from the village to Accra. Agyepong had dreams of becoming either a pilot or a marine engineer but fate left him in the street. “I started an electrical engineering course and in 1990 I completed the course and my father said he no longer had the money to contribute to my education so I had to go into business. He suggested I should go and assist my mother who had a little shop where she was squatting in front of somebody’s business. I started helping her like a petty trader selling exercise books on the streets,” says Agyepong. That was the first step on a journey that has led to one of the most diversified holding companies in Ghana. 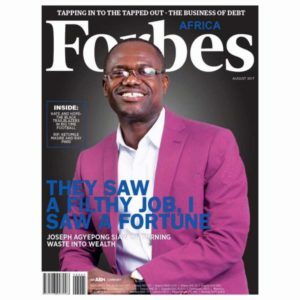 Agyepong is today responsible for the strategic vision of the Jospong Group of Companies, with operations in Africa as well as Asia and the Middle East. The company has business interests in many sectors of the economy with its biggest operations in waste management, ICT, and banking. Agyepong’s strategy is slightly unorthodox. He believes he is guided by a higher power with the right direction at the right time. At the age of 22, Agyepong would go early in the morning to his mother’s little shop and pack exercise books in boxes and walk off with them on his head to sell through the busy streets of Accra. His persistence paid off and very soon Agyepong was selling enough books that he could invest in other businesses. “I tried every business. When it was the Christmas season, I would put the books aside and go to the local market and buy jewelry and shirts and take them round to people and try and sell them. I was doing each business on a seasonal basis and when the demand changed, I switched my products,” he says. Soon it was time to expand. Agyepong saw an opportunity to start his own printing business and asked his mother to support him with GHC3 ($0.70) as start-up capital. That ushered in the birth of Jospong Printing Press in 1995. The following year, Agyepong stumbled on an opportunity in construction. A client was looking for a contractor and the resourceful entrepreneur pitched and delivered the contract by outsourcing the various building activities to local tradesmen and in the process Agyepong established his construction business, Extended Builders. In 1998, during the Ghana elections, he saw yet another opportunity to print t-shirts for the election campaign and Appointed Time Screen Printing was born. Since then, the company has established a holding company with subsidiaries in oil and gas, logistics, quarry and mining, manufacturing as well as agro-business. In 2006, there were difficulties in managing solid waste in Ghana. It became an issue of great concern to Ghana’s citizens, mainly due to its environmental health implications. The United Nations Conference on Human Settlement report stated that between 33% and 50% of solid waste generated within most cities in low and middle income countries are not collected. Instead it is illegally dumped on streets and open spaces. Furthermore, a 2002 report by the African Development Bank stipulates that Ghana generated about 3.6 million tons of solid waste per year, made up of predominantly organic compost, such as food, plastic and wood waste. These critical challenges presented yet another opportunity the serial entrepreneur could not ignore, one that would prove to be Agyepong’s most lucrative business to date. To make his next business venture a success, Agyepong knew he had to overcome certain stereotypes associated with waste management. His eureka moment happened on a visit to China. “I first visited China and saw people using tricycles, so I bought one in a container and brought it back to Ghana and I asked people to try it. I then built an assembly plant in Ghana and started assembling the tricycles myself. I started with the tricycles because I said I needed more people to help collect the waste and if we relied on a truck and the truck breaks down then we would be in trouble,” says Agyepong. Next was convincing local government districts to adopt his innovative idea. Soon, demand for his tricycles increased and Agyepong was faced with cash flow problems. Due to the lack of profitability of the venture, he had to think outside the box to raise funds. With a bank loan of GHC30,000 ($6,800), Zoomlion began its expansion. From starting with 1,000 tricycles, the company currently has 15,000 and 30,000 motorized and manual tricycles respectively, with a fleet of waste management trucks as well. The company also has a combined core staff of 3,000 and manages over 85,000 workers under various forms of Public Private Partnerships (PPP). Zoomlion currently has operations in Togo, Angola, Zambia and Equatorial Guinea and Liberia. Agyepong also established The Africa Institute of Sanitation and Waste Management (AISWAM), in partnership with the Kwame Nkrumah University of Science and Technology (KNUST), to help meet the technological and human resource needs of the waste management industry. AISWAM gives people the required skills for efficient waste management using modern technology. For Agyepong it is not so much about the money but building an organization that can stand the test of time. There were, however, some roadblocks along the way. In 2013 the World Bank debarred Zoomlion Ghana and Zoomlion Liberia for two years. Zoomlion was accused of fraud and paying bribes to secure contracts. “In 2008, we went into Liberia where we secured a World Bank contract and one of our staff, during the contract proceedings, committed certain errors, which were an infraction. The contract was for the construction of a landfill,” says Agyepong. It was a wake-up call for Agyepong. He immediately set out to strengthen corporate governance throughout the Jospong Group of Companies. In 2015, the company was removed from the World Bank’s list of sanctioned companies. Creating jobs has always been key for Agyepong, which resonates with the government. Since the establishment of Zoomlion, Agyepong has created two to three companies every year. Investment and diversification is more important to him than comfort. “The growth of the company has been phenomenal since its inception as a printing press, with operations in diverse sectors at the moment. This is hugely attributed to Siaw’s leadership style as well as his focus on quality service delivery at a competitive price. The core philosophy of the business is to identify opportunities and provide solutions, roll out innovative business models, build capacities to provide value and nurture them to become market leaders,” says Chris Koney, a journalist for the Business and Financial Times in Ghana. Agyepong is obsessed about finding solutions to everyday problems. “Wherever there is a problem, I like finding out how to solve it. At that time, everybody was talking about how much of a problem we had with waste management so I moved to solve the problem,” he says. Currently, Agyepong is looking for a solution to curtail the numerous fires in Ghana. Given his proclivity for out-of-the-box thinking – and the skill to spot the potential of a tricycle in China – the flames could soon be doused. This feature appeared on the cover of Forbes Magazine in August 2017.